Supertuff Polykarts provide a simple cost effective method to maintain cleanliness and aesthetic beauty. They are ideal for lawns, gardens, parks, housing societies, road sides, schools, offices and residential schemes. 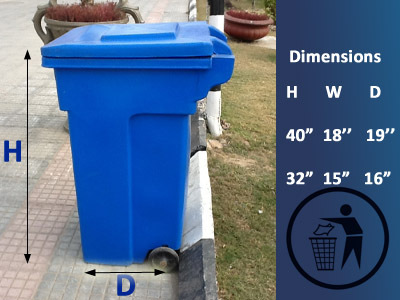 They are light enough for easy transportation; the open top allows for easy access to remove the garbage bag while the front door allows for pedestrians and people to dispose off garbage into the garbage container withouth having to open the top. 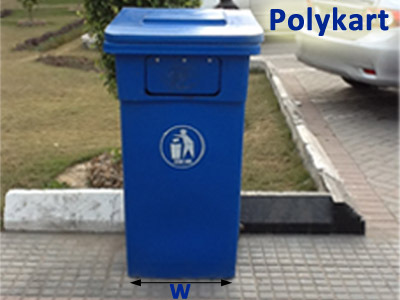 Polykarts are made from high quality polyethylene. 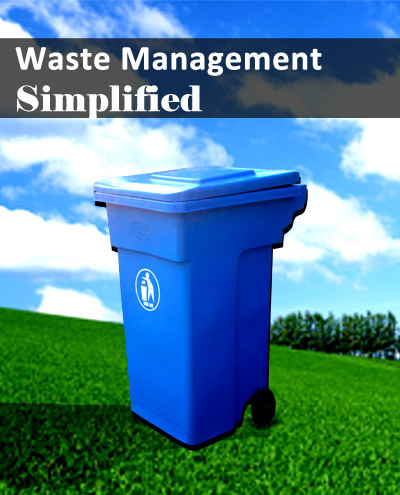 The unique design of the product allows for maximum strength and rigidity that makes the garbage container robust for many years of operation. It is installed with strong metallic wheels that allow for easy transportation of the container. The Polykart can also be customized to be fixed on a stationary position. 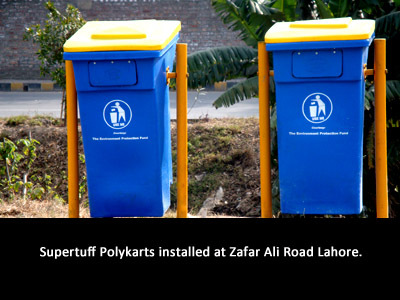 Polykarts are availabe in a variety of colors for example the Lahore Development Authority LDA polykarts are yellow; Polykarts used by the Defence Housing Authority DHA are a mixture of Blue and Yellow (lids). Depending on the client, virtually any combination of colors can be used for color coding. These containers are repairable, customizable and can be printed with messages according to the client's requirement. Supertuff Polykarts are availabe in 2 sizes. The dimensions are given in the picture at the right bottom corner of page. For further information on Polykarts please feel free to contact us at any of our given numbers.